They all lay in stone houses in their great city of R’lyeh, preserved by the spells of mighty Cthulhu for a glorious resurrection when the stars and the earth might once more be ready for them. The time would be easy to know, for then mankind would have become as the Great Old Ones; free and wild and beyond good and evil, with laws and morals thrown aside and all men shouting and killing and revelling in joy. Then the liberated Old Ones would teach them new ways to shout and kill and revel and enjoy themselves, and all the earth would flame with a holocaust of ecstasy and freedom. But not today, obviously. They’re busy today. Well, the Book burned yesterday, that’s the big update. David was in his bedroom reading it, and then it suddenly jumped off the desk, landed on the linoleum and spontaneously burst into flames. Now we don’t have a “the Book” anymore, which is fine with me. If the props are going to commit suicide in the middle of a scene, then I’m not going to stand in their way. What has the Book done for me, lately? It’s getting close to closing time for the Leviathans, who’ve had several months to make something of themselves, to no avail. They’re trying to get Carolyn to fall in love with Jeb Hawkes, a handsome, brooding twenty-something who secretly turns into a tentacled pig weasel when you leave him alone in his bedroom for too long. That union will bring about the rise of the Great Old Ones, somehow, and turn the earth and its inhabitants into helpless playthings for the hideous elder gods. This plan is going surprisingly well. Carolyn likes Jeb, and occasionally, she manages to get all the way through a date without losing consciousness. This is progress. But Jeb doesn’t want to just turn into a radioactive monster man and carry her off to their bridal transformation chamber. He wants her to come to him willingly, like Barnabas wanted Vicki to do, and you remember how well that went. This is kind of moving the goalposts, but they never really said where the goalposts were in the first place, so who can tell if they’re being moved? The upshot is that we’re now pretty close to an ending for this storyline, but nobody’s sure what that ending is supposed to be or what happens afterwards, so they’re going to do special effects for a while and see if something turns up. So there’s a ghost, is what I’m saying. David’s extremely haunted house is being haunted by a ghost. It does all the usual specter trickery — knocking the lights out, blowing out a candle. Oh, and the chill. “Don’t be frightened, Amy!” David is hollering instructions. “You’ve got to fight it! You’ve got to!” And now Amy has to figure out how to fight a chill. 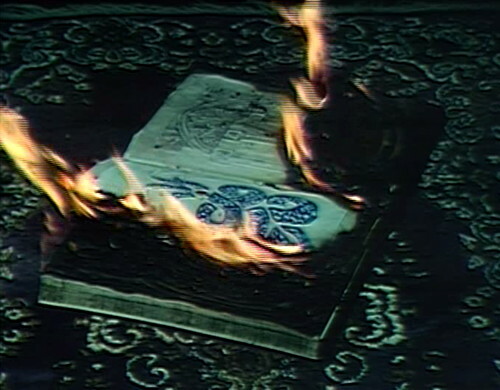 That’s when the Book flies off the table and immolates itself, which the kids get upset about, but hello, you said you were cold. 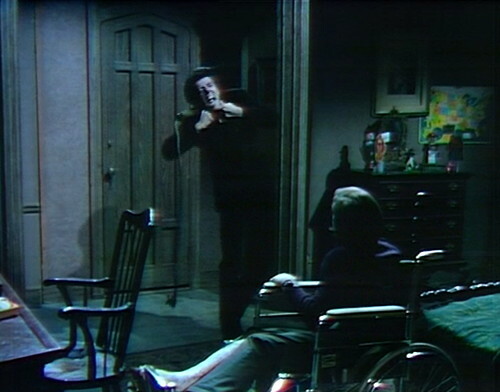 Later on, when David’s sitting around in his room shooting anxious glances at the thermostat, there’s another sudden blackout, and then we see a hanging man in the hallway, swaying in the breeze. “Help!” David cries. “Help! Somebody help me! There’s someone in the hall! He’s hanging there!” Nobody comes to help him, which is irresponsible considering he’s in a wheelchair, although to be fair, as a cry for help, “there’s someone hanging in the hall” is a hard cry to parse. Just shut the door. Once that blows over, David gets a visit from Bruno, a random Leviathan henchman who’s recently been promoted to majordomo, because cult honcho Jeb has declared war on and/or murdered all of his other surrogates. 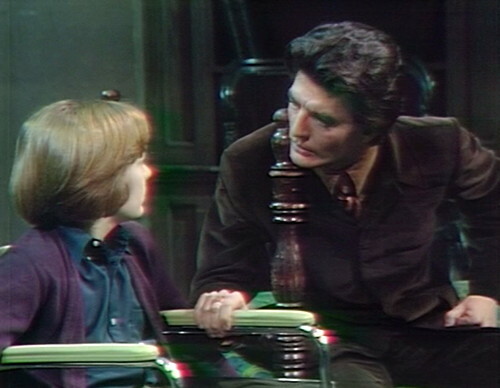 So I don’t know what to do with the idea that David needs special protection from ghosts at Collinwood, and that Bruno is the guy to provide it. This is Collinwood, the most haunted mansion on the Eastern seaboard. David’s been making friends with ghosts since he was nine years old. But this is what’s happening to the mighty people of the Leviathan, these days. They’ve spent months huffing and puffing behind closed doors, walking around like they’re untouchable, telling everybody that their time has come. But as soon as somebody pushes back, the Leviathans just go all to pieces. Turns out they can’t take a joke. “We’re going to try and figure this out right now,” says Bruno. Then David says “How?” and Bruno answers, “I don’t know,” which tells you everything you need to know about the Leviathans’ emergency protocols. Apparently Bruno didn’t attend the intelligence briefings. “The only thing that’s obvious,” Bruno says, as he gets up and paces around the room, “is that someone from beyond the grave is trying to contact you. Our first job is to find out who, and why.” That’s two jobs. Bruno looks grave. “Because only the spirits of those that we’ve killed would dare to — to harm us this way!” This is a difficult assertion to refute. 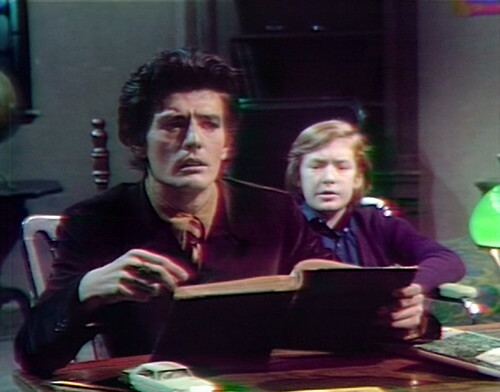 So Bruno goes and gets the Collins family history, which is the other “the book”, because he thinks there’s going to be a clue in it to tell them who in history was pissed off by the Leviathans. There isn’t. If the family history had any Leviathan-related content in it, we’d have heard about it by now. “That’s okay, I’ll be all right,” says David, who was just fine before Bruno got here. Bruno says good night and heads for the door — but then the lights go out, and David exclaims, “That’s exactly the way it happened yesterday!” which is accurate but not particularly helpful. And then Bruno squeals, “There’s something around my throat! It’s choking me! It’s choking me!” These are the new masters of Earth. There’s a dramatic sting and a commercial break, and when we come back, Bruno’s got the business end of a noose around his neck, and it’s choking him. This is fine with me; I have no particular use for Bruno. Nobody asked him to come over in the first place. This is the moment where it all goes wrong for the Leviathans, really, because they start spending all of their time fighting werewolves and imaginary assailants, instead of moving the story forward. Jeb and Bruno and David and Amy should be coming up with nefarious plans against their enemies, not babysitting each other and getting trolled by ghosts. Last week, the big event was that Jeb defied the cult rules, and earned a visit from Nicholas, the demon in charge of this hapless invasion, who fretted about their progress. The Leviathans were terrifying, according to themselves, and Collinwood was doomed. Now we’re supposed to care about how stressed out they are. After a while, Bruno takes the noose off his neck, and all of a sudden we’re having a conversation about how you can tell how old rope is. 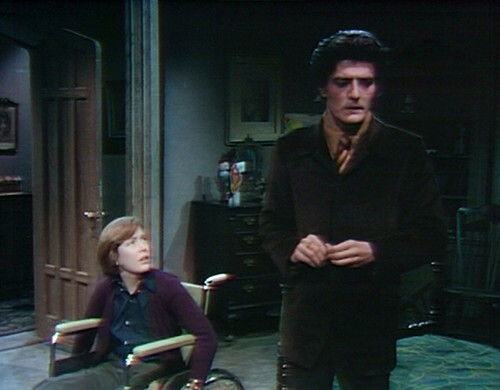 Then Bruno goes downstairs, and asks Carolyn if David can move to another room tonight. Carolyn looks at Bruno, and sighs. Carolyn smiles. “All right, David. I suppose it can’t do any harm. We’ll put you in another room.” And then she and Bruno wheel the kid out into the hallway, because I guess Carolyn is in charge of where people sleep. This is an enormous mansion with probably dozens of unused rooms, so I don’t know why David has to ask permission to go and be in a different one, although the real question is: how does it help David, to change bedrooms? I’m pretty sure the ghost will be able to find him, if it wants to. Also, why is the ghost being a jerk to David in the first place? Also, why did it stop choking Bruno? Also, when is this storyline over? So I suppose Carolyn is right; it can’t do any harm, except to the audience, who have to watch the villains stand around and complain about how scared they are. I thought being evil was supposed to be fun. I’m going to have a very serious conversation with the Old Ones about this, if they ever show up. As you can see in one of the pictures above, when David looks at the hanging man in the hall, you can see where the wall stops. There’s a visible gap, and then a different wall. When the lights go out again, David says, “That’s exactly the way it happened yesterday!” — but it only happened tonight, right before Bruno arrived. It’s only been about seven minutes since then. When Bruno thrashes against the dresser in David’s room, the wall moves. As the camera pans from the grandfather clock across the foyer, you can see one of the studio lights above the drawing room. David says, “I kind of feel like somebody’s been in this room, somebody that none of us can see!” At that moment, someone in the studio coughs, which proves his point. As Chris realizes that Bruno is behind him with the gun, a crew member walks past the window. It’s a David’s room-heavy episode, so we get another look at his stuff, which I’m worryingly interested in. 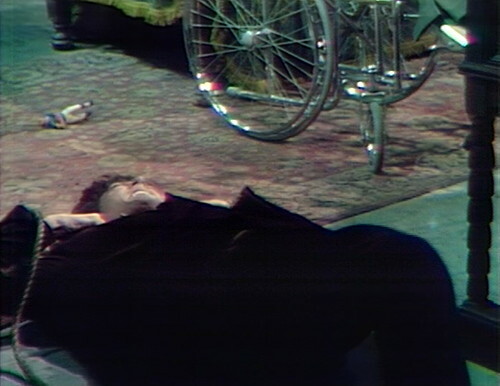 Today, Bruno knocks some stuff off David’s dresser during the noose-choking scene, and it looks like he does it deliberately too, the jerk. God, Leviathan people. Casualties include the football player, the dog and girl with protest signs, the nutcracker-soldier thing and one of the robots. When Bruno’s rolling on the floor, the football player is lying next to him, pointedly not offering to help. Bruno, stealthing in Chris’ bureau, opens the top drawer and pulls out chains and handcuffs. Sabrina and Chris nevah, EVAH do nuthin’ nice…an’ easy…they always do it nice…an’ rough! Just guessing, possibly that mysterious new gizmo in the Dave Cave is a Crookes radiometer? And is anyone else getting really tired of Bruno trying to be menacing or all-knowing or…well, okay, just getting tired of Bruno, generally? The ‘watch the moon rise’ laughter at the ending was particularly irritating. I was just watching the episode today where Sabrina has a flashback to when she first saw Chris transform and it sent her into a catatonic state. She could have saved herself a lot of trouble if she hadn’t been quite so committed to the whole “Hee-hee, aren’t I a kookie, ninny little girl” identity or the mid-sixties “If my big strong man grabs me, slaps me around, and screams at me to get lost and leave him alone, it just means he loves me and needs me to take care of him and cheer him up” philosophy,” she wouldn’t have spent the last two years in a cheap Halloween wig and an FDR wheelchair, being groped by her brother. If anyone was really ready for the women’s lib movement, it was the werewolf’s girlfriend community. Urgh. He’s Aristede with no Petofi to boss him around and much MUCH bigger hair. I’d like to see Bruno as a good guy – maybe even a romantic lead. I bet that smile of his could charm the birds out of the trees – when he wasn’t being sadistic. Yeah, that might have worked; but I suspect that it would end up kind of like it did when DS tried to have Don Briscoe be villainous as Tim Shaw. And while I’m mentioning ‘Dreamboat Don’, he sure sold that kiss with Sabrina (or is it just that he could probably sell nearly anything to me?) – I didn’t even mind that he’s wearing yet another trenchcoat! What, did they get a bulk discount from Ohrbachs? Overstock? Fire sale? “Dave Cave”. That makes me happy. It makes me happy to make you happy, Danny. A big problem with the Leviathan storyline is that it goes on well past the point when it is supposed to end. In a properly constructed story, the creature would be dispatched as soon as it grows to adult size and goes for Carolyn. And his destruction would involve some firepower, and Chris Jennings as werewolf. 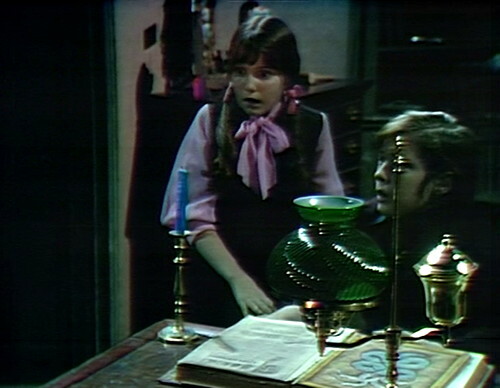 But of course, Barnabas was in charge…. 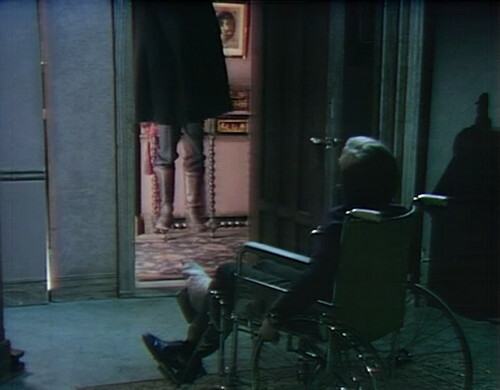 Now, if Bramwell was in charge, he would just shout them down. I’m in 1840PT, which as serialized narratives go, is The Woman In White for the show. The Leviathans are not the death knell, they are the stumbling block. Great things are ahead. I know. Can’t wait for 1970PT. The theme to the PT timelines is how outcomes are different based on the choices we make. In the 1840PT timeline, Barnabas never met Angelique, married Josette, had Bramwell, and died a natural death. All this, so that Frid wouldn’t have to be a vampire anymore. Turned the show back into almost basic soap opera. But the acting performances were mostly pretty darn on. Notably, Lara Parker, who finally got to play a good person, and should have saved the show. I’m glued when she is onscreen. Her best work. Fridspeak wasn’t much of an issue, as he wasn’t a main character. It was Keith Prentice that killed it. The dim bulb that ruined the tree.